A 1989 grey stallion by Jaborr and out of the Fadjur daughter RF Fadjurs Flame, Jaborrs Impack has made an impact in the reining division. Since 1994 when he was Scottsdale Arabian Reining Horse Champion, the reining superstar has been in the winner’s circle at countless regional championship shows, Scottsdale and the U.S. and Canadian Nationals. He was U.S. National Champion Arabian Reining Horse in 1996 and Canadian National Champion Arabian Reining Horse in 1998. During his career he has also amassed multiple Youth Nationals’ titles. 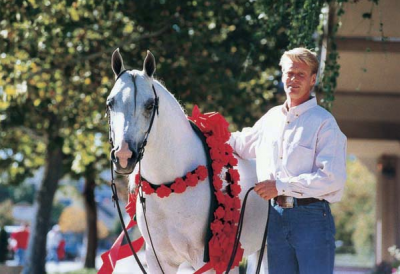 Jaborrs Impack is also a prominent breeding sire, with his offspring such as TR Cockadoodledoo, the 2009 Scottsdale Half-Arabian Reining Junior Horse Champion, following in their sire’s successful hoofprints.